There are two major things that are holding back the increase in the electric car business. The first is the cost of the cars to consumers. The exact same car with a gasoline engine is often $5-$10,000 less than an electric car of the same model. As a result even with subsidies the electric car is still more expensive than its gasoline counterpart. The second thing that holds back consumers from buying these cars is the distance you can go on a full charge. Also locations to recharge your batteries. 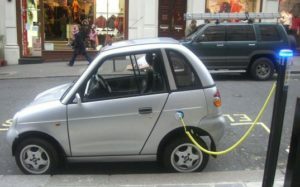 Several states in the United States have decided to give the electric car business a boost. Their objective is to reduce pollution and improve the general well-being of the population. As a result by reducing gasoline driven cars they hope to make a major contribution in the war against pollution. Eight states are involved. They represent nearly a quarter of US auto sales. They have agreed to increase the number of electric and hydrogen fueled cars, trucks and buses on the roads. Their goal is to have 3.3 million vehicles by 2025. California is leading the way with an announced goal of 1.5 million zero emission vehicles in the next 12 years. They are going to accomplish this goal by ensuring there are more points along the highways to recharge vehicles. They’re going to continue with subsidies and increase subsidies to ensure that the consumers are more willing to spend money on electric vehicles. Even with $10,000 subsidies some electric vehicles are still more expensive than their gasoline counterparts. As a result the savings will come from the reduced cost to operate the vehicle using electricity instead of gasoline. The practical issue of being able to drive your car and recharge it at a convenient location is of paramount importance. This issue needs to be solved in the near future if these objectives are going to be met. The majority of trips made by consumers are less than 40 miles every day. With incentives to install charging stations at employer locations. Along the highways and even at consumers homes. Would provide more posts on the subject is more information comes along. We recently wrote a post about 20 new electric charging stations being installed along the 401. This is between Montreal Quebec and Windsor Ontario. This is a start and we will see a lot more in the years to come.